From community to sects, sub-sects: Now a Shia TV Channel ? Just got to know that the Shia community in India is planning to start a television channel of its own. I am not very much impressed. Already the cable-wallahs have little bandwidth to show fresh channels and given the fact that Shias are a minority within a minority it will be even difficult to get it viewd. Except in Hyderabad, Lucknow and parts of Kashmir where else would peope able to force the cable-wallah to show it. Meanwhile, I have yet to hear about any sub-sect launching its own channel. I mean I find Hindu channel, local small-time Jain religious channels, Christian channels but not of sub-sects. In fact, some Hindu religious channels show the programmes of Jains and Sikhs also. It would be better if Q TV [now ARY] allots sometime to the Shia brothers as well. But I don't think any of the side would like it. This [Shia channel] is the plan of the recently floated All India Shia Personal Law Board (AISPLB). The other day an elderly gentleman was telling me that how Q TV is 'corrupting' the Muslims in India with its Barelvi overdose [qawwalis and similar things that irritate this man who probably finds all this un-Islamic] though indulges in a hundred other 'bidah' himself. But nobody wants reconciliation, everyone seems so rigid that only their personal interpretation and understanding of faith, sect or sub-sect is correct and the rest are all--astray. Long ago I had decided not to discuss and disssect religion and religious practices. There is quote or saying that it is a great fallacy that talking out things help rather they aggravate. So let us have all sorts of religious TV channels representing all thoughts. I already watch none except Pogo [the kids' channel] and often the corrupting Fashion TV FTV. Nida Fazli is a renowned Urdu poet and lyricist, who has penned numerous songs for Bollywood movies. I have written a separate post on this blog about Nida Fazli and his contribution to literature. You can also read his verses in Urdu, Hindi and English scripts at the website BestGhazals.Net here. But right now, here is an emotional poem titled Maa.n [Mother]. Read Nida Fazli's poetry at this link. So RSS Chief Sudarshan has asked Muslims to give respect to Krishna and treat him as one of the paighambars/ prophets. Mr Sudarshan, which world you live in? I am sure you know nothing about the culture of this country, at least above the Vindhyas which is often termed as Cow Belt. My dear, we always treat Rama and Krishna respectfully. And this is true. As a child my father always used to chide me if I said Krishna or Rama. He always asked me to say Krishna Ji and Ramchandra Ji. Unlike just Rama or Krishna as my non-Muslim friends used to say. This concept of 'waza-daari' and the mutual respect of culture was part of Oudh, Bihar, MP and all over Northern India including Bengal. Sudarshan may not be aware of that. It is not just cultural reason and that because we are living in India among Hindus, but also as per our religious beliefs, Lord Rama and Lord Krishna or other religious figures are to be respected. The Holy Quran says that Allah sent messengers to all lands, to all people and amongst all religions. How is it possible that he didn't send them to India? Do RSS guys have any idea about the culture existent for centuries where Muslim poets used to write poetry praising Krishnaji and Hindus wrote 'na'at' in praise of Prophet Muhammad. This was not for sake of any social responsibility but for one's inner self, beliefs and the true feeling of respect towards the great and reverential figures. The RSS fellows would never appreciate this because they can't read Mohsin Kakorvi's 'Simt kashi chala jaanib-e-mathura baadal...' which is in Urdu. 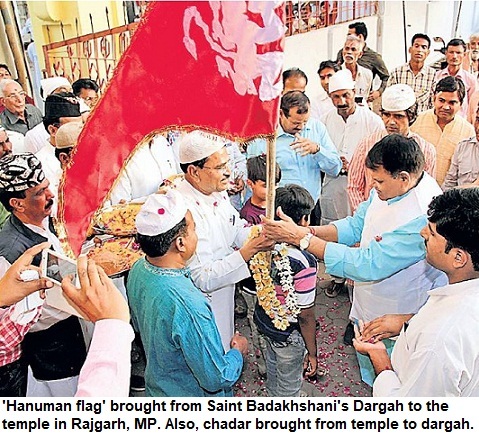 All over India ordinary Hindus continue to observe Muharram despite the rise in anti-Muslim rhetoric. So what if you consider going to Dargah as a 'Muslim practice, Hindus continue to go to Sufi saints' graves, though even sections of Muslims now avoid going to mazaars. The lesson: Hate never succeeds. The RSS has a huge cadre. They should try to reach out to Muslims. Why don't they go to Muslims, meet Muslims, increase the level of interaction with the minorities? This could be the real step towards integration. They talk about ghettoisation but do they raise voice about the fact that section of Jains and Gujarati Hindus [housing societies] never let Muslims buy a land or flat in their area? Ever heard about 'baana', banethi, binwat [binnaut], khari gatka? These are all traditional arts of self-defence. These days, it's rare to find the experts, as Akhadas have lost popularity to the sophisticated Gyms. Once I saw that spectacle where a hen was pushed under a cot and a man standing on the cot played the lathi so fast that the hen couldn't get out of any of the four sides of the cot. Just because the hen felt that a cloth had been wrapped all around the 'palang' from four sides. Such was the lightning speed at which he moved his lathi! The poor animal would rush on all sides but couldn't get out because the speed at which lathi moved on all four sides made it impossible for it to get out. Umpteen such martial arts like the one in which a coin was tied in a piece of cloth and even this 'weapon' turned lethal for the attackers are now history. Or the breathtaking display of fire where a man plays with balls filled with embers creating a brilliant spectacle at night. Unfortunately the governments banned the Akhadas in most of the places. When the martial arts came to us from the West, everybody imitates them and classes are run to teach them but our native arts are all gone. In fact, the native arts brought Hindus and Muslims nearer. 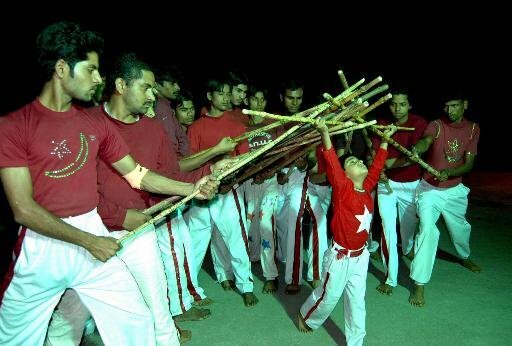 There was display of such skills on Muharram, Dussehra and other religious events. In Akhadas, Hindu Ustaads had Muslim disciples and vice versa. Due to the vows of using such arts only in defence and for saving the weak against strong, the exponents of these arts never misused their skills. Still the arts were discouraged. 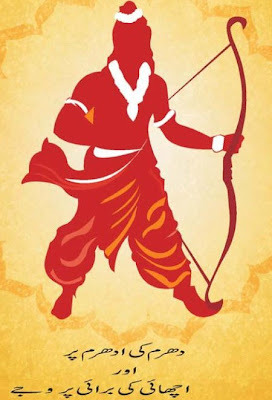 While the thugs of the political parties on the loony fringe who have no art are allowed to carry the guns, trishuls and all sorts of weapons, the real pahalwans who used to spread harmony and displayed their skills thereby causing awareness about health and fitness were shunted to the periphery. On Muharram, Milad-un-Nabi and Dussehra, the Hindu and Muslim akhadas all over India used to display their skills. It was such healthy competition. Today all this is lost. Save for a few cities. Unfortunately we are such monkeys that one day these skills would be brought to us in the name of Samurai by Westerns and we will all rush to learn them like we abandoned yog and when it returned as yoga we got mad. 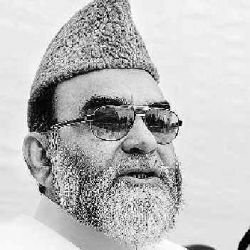 Mohammad Ahmad Khan, the husband of the legendary Shahbano died in Indore this week. Khan was 94. Khan, a lawyer, had given divorce to his 62-year-old wife Shah Bano in 1978 after she had given birth to five children from him. 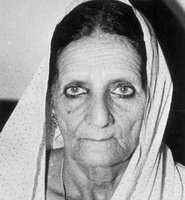 Shahbano went to the court seeking maintenance and fought up to the Supreme Court that also ruled in her favour. But the turbulent decade of 1980s brought Muslims on the streets. It was in the backdrop of the Shilanyas and Hindus saw it as another minority appeasement when Rajiv Gandhi-led Congress brought an amendment and enacted the Muslim Women [Protection of Rights] Act. 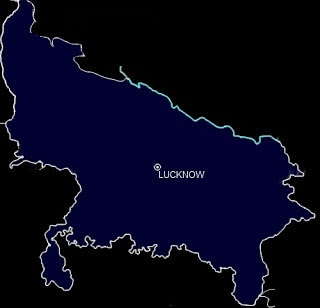 From here, came the word 'appeasement' or 'tushtikaran'. The word was coined by right-wing to prove that in case of Muslims, even court's judgement is overturned, while Hindus don't get a fair deal despite being the majority community. The Shahbano case saw the birth of the fiery Syed Shahabuddin and several other leaders. He made several irresponsible comments and gave suc speeches that angered Hindus. Already middle-class was getting lumpenised. LK Advani seized the opportunity. The rise in communal feelings led to the resurgence of BJP that increased its number from 2 seats to 86 in Parliament. This later caused the demolition of Babri Masjid. The heat is felt till today. Shahbano case was a watershed. She died a couple of years back in Indore, lonely with almost no media attention. Her husband died now. Their eldest son is a senior lawyer now. Budhni was a tribal girl. She had been asked to garland Prime Minister Jawaharlal Nehru to welcome him when he visited Purulia in West Bengal in 1959. The Damodar Valley Corporation (DVC) chose this 15-year-girl working as a labourer to welcome Nehru. But when she returned after welcoming him, the villagers treated her as outcast because as per their tribal custom she was married to Nehru. It was because of the garland. Worse, she was considered 'wedded' to an outsider so she was to have no relations with them in future. What a cruel joke fate had played on her. 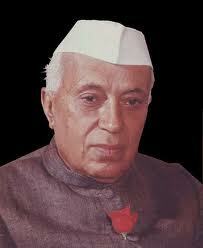 In a meeting of tribal elders it was decided that Budhni was Nehru's wife. She was evicted from village and not even offered a glass of water at any door. It is really a sad story. For her, it was fate. She didn't do anything on her own but her life was thrown into turmoil just because of a single incident. Later in life, she started living with one, Sudhir Dutta, and their daughter was also not accepted by the tribal community. But suddenly she was sacked by DVC for reasons that were never made public. In 1985 she went to Delhi and met the then PM Rajiv Gandhi who ordered her reinstatement. Her fate is not known thereafter. Budhni is alive in the year 2012. After false news about her death was reported in English media, the Hindi newspapers located her. See her photograph and read the news AT THIS LINK.